This activity is related to a Teachable Moment from March 14, 2016. See "Pi Day the NASA Way." 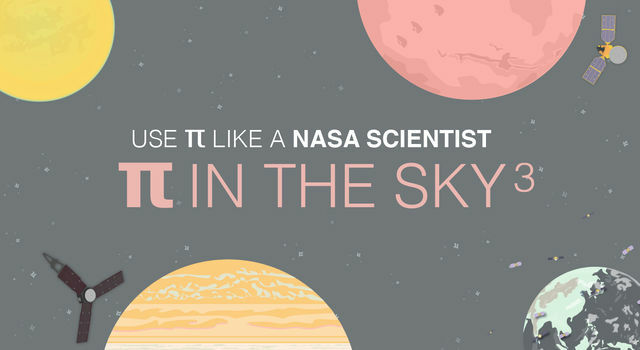 The third installment of the popular "Pi in the Sky" challenge, this illustrated problem set gives students a chance to put their pi skills to the test to solve some of the same problems NASA scientists and engineers do. Students will use pi to map the surface of Saturn’s hazy moon Titan, track the Mars Reconnaissance Orbiter as it explores the Red Planet, keep Earth’s satellites powered as Mercury transits the sun, and put the Juno spacecraft into orbit around Jupiter. Print it out, hand it out or view it online! The problem set is available as a poster, classroom handouts and an online slideshow that is mobile, tablet and screen-reader friendly. March 14 marks the yearly celebration of the mathematical constant (pi), which represents the ratio of a circle’s circumference to its diameter. More than just a number for mathematicians, pi has all sorts of applications in the real world, including on missions developed by NASA’s Jet Propulsion Laboratory. And as a holiday that encourages more than a little creativity – whether it’s making pi-themed pies or reciting from memory as many of the never-ending decimals of pi as possible (the record is 70,030 digits) – it’s a great way to have fun and celebrate the M in STEM. Pi is what’s known as an irrational number, meaning its decimal representation never ends and it never repeats. It has been calculated to more than one trillion digits, but 3.14 is often a precise enough approximation, hence the celebration occurring on March 14, or 3/14 (when written in US month/day format). The first known celebration occurred in 1988, and in 2009, the US House of Representatives passed a resolution designating March 14 as Pi Day and encouraging teachers and students to celebrate the day with activities that teach students about pi. Pi Day is lots of fun, but its importance lies in the role that pi plays in the everyday work of scientists and engineers at JPL. Bryana Henderson, who specializes in planetary ices, uses lasers to explode ice samples and study their composition. "I use pi to calculate the width of my laser beam, which in turn can be used to calculate the amount of energy, or fluence, that hits my ice sample," said Henderson. "A larger fluence equals a bigger explosion in the ice, so this is a very important parameter for us." Blog: How Many Decimals of Pi Do We Really Need? Share how you're celebrating Pi Day 2016! Evaluate expressions at specific values of their variables. Include expressions that arise from formulas used in real-world problems. Perform arithmetic operations, including those involving whole-number exponents, in the conventional order when there are no parentheses to specify a particular order (Order of Operations). For example, use the formulas V = s^3 and A = 6 s^2 to find the volume and surface area of a cube with sides of length s = 1/2.